Spikes for all! With this introductory experiment you will join the neuro-revolution and learn about how our brains communicate with our bodies! CCSS.ELA-Literacy.RST.6-8.10 By the end of grade 8, read and comprehend science/technical texts in the grades 6â€“8 text complexity band independently and proficiently. CCSS.ELA-Literacy.RST.11-12.4 Determine the meaning of symbols, key terms, and other domain-specific words and phrases as they are used in a specific scientific or technical context relevant to grades 11â€“12 texts and topics. CCSS.ELA-Literacy.RST.11-12.10 By the end of grade 12, read and comprehend science/technical texts in the grades 11â€“CCR text complexity band independently and proficiently. When a cell is at rest, it is in a state called resting potential. Resting potential occurs when the cell has a balanced charge and positive ions of sodium and potassium (Na+, K+) and the negative ions of Chlorine Cl- are evenly distributed on different sides of its membrane. This uneven distribution of ions creates a negative charge on the inside of the membrane. If a neuron is stimulated by another cell it will generate an action potential (AP). During the AP, the membrane has a fast rise and fall in electrical potential caused by the movement of ions across the membrane. The action potential begins in a small section of cell membrane that acts as fast moving, signal. A sodium ion will enter the cell giving the membrane positive charge. Then a potassium ion will be released near this region of the cell membrane to balance the charge. The AP has a distinctive "spike" shape that you can see above. The AP, once initiated, will spread down the membrane of a cell, thus allowing a cell to communicate with astonishing speed (80 m/s). Neurons can send APs, or spikes, in specific patterns down their axon to convey information at a synapse, where it can communicate with another neuron through chemical signaling. 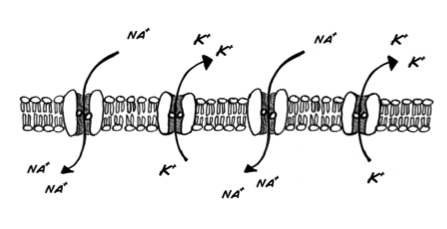 An action potential travels down the cell membrane activating sodium and potassium ion channels. The change in charge will travel until it reaches a synapse and the information can be communicated to another cell. Synapses are the point of communication between two neurons. While an AP is an electrical signal that allows a neuron to communicate along the length of its axon, it is not a signal that can jump from one cell to the next. This requires a neuron to convert the electrical signal to a chemical one in order to successfully communicate with other cells. This communication occurs in the synapse. In a synapse, a neuron sending the signal, the presynaptic cell, will stimulate a receiving neuron, the postsynaptic cell, by placing a chemical signal into the synapse. Called a neurotransmitter, this chemical signal will either excite or inhibit the postsynaptic cell. You may already know several neurotransmitters. Several well-known ones secreted by the presynaptic cell are glutamate, GABA, dopamine, serotonin, and acetylcholine (ACh). The postsynaptic cell has the specific receptor for the neurotransmitter, which causes changes in electrical excitability in the postsynaptic neuron once the neurotransmitter binds to the receptor. Electrophysiology, the study of the electrical properties of cells, allows researchers to study how neurons communicate with each other and form complex neural networks. In particular, scientists and physicians use electrophysiology to measure the properties of APs in living neurons. Two of the most common approaches used to study APs are to record from either an intracellular or extracellular perspective. Intracellular recordings allow someone to measure either the voltage (charge) or current (movement of ions) across the membrane of a single cell. This technique requires the insertion of a recording electrode, housed inside a hollow glass pipette, into the membrane of a neuron. A second electrode, the ground electrode, is placed extracellularly. The difference in electrical activity (voltage or current) between the intracellular recording and extracellular ground electrodes reflects the electrical activity of the neuron being studied. It is important to remember that intracellular recordings are measuring the change in electrical properties across the cell membrane from the perspective of being inside the cell. This technique can be difficult to perform as the neuron impaled with the glass pipette cannot be moved more than a few microns without damaging or even killing the cell. Extracellular recording is a second electrophysiological technique that measures the voltage and current across the membranes of neurons. However, rather than having to insert an electrode into a single cell, extracellular recordings can be made by simply placing a recording electrode adjacent to a cell membrane. For these experiments, measurements of charge and movement of ions across cell membranes will appear to be inverted compared to intracellular recordings. This is because the recording electrode is measuring ions entering and leaving the extracellular space. Another important way in which data collected from intra- or extracellular recordings differ is the amplitude of APs collected. APs collected from intracellular recordings are consistent in their amplitude during an experiment. This is because there is little difference in how APs look once they are initiated. However, the amplitude of APs collected from extracellular electrodes can be of varying sizes for several different reasons. The first is that extracellular recordings may be measuring electrical activity from multiple cells at one time. If multiple axons near an extracellular electrode are sending APs down their axons, the resulting data will be larger. Additionally, larger axons can also increase the amplitude of a measured APs in an extracellular setup. However, keep in mind that the AP recorded by an extracellular electrode will get smaller the farther away the axon is from the point of measure. The SpikerBox is used to perform extracellular recordings. 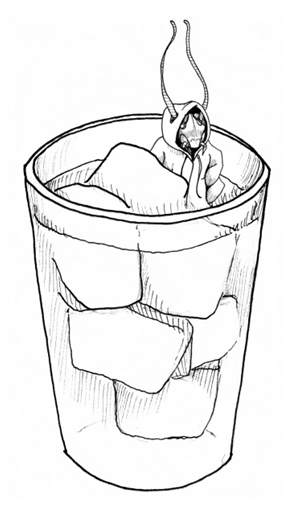 To observe the anatomy of a cockroach, first anesthetize one by placing it in a glass of ice water until it is no longer moving. The anatomy of the cockroach is exceptionally accessible to electrophysiological experimentation for a variety of reasons. First, from the dorsal, or top, view the cockroach has a distinctive prothorax (the section directly behind, and shielding the head) and wings that give the cockroach its distinctive armored look. When flipped on its back, the ventral aspect of the cockroach reveals the basic segmented body sections distinctive of insects: the head, thorax, abdomen, and legs. Identify the major delineations between these sections, and observe the segmentation inside these major regions. 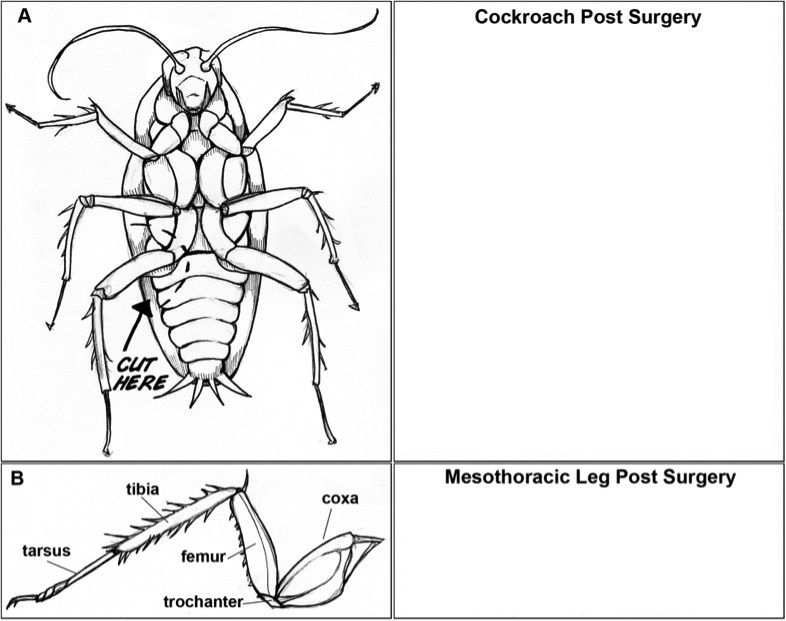 For this lab, you will be removing a leg from the cockroach's mesothorax, the last and largest leg closest to the abdomen. 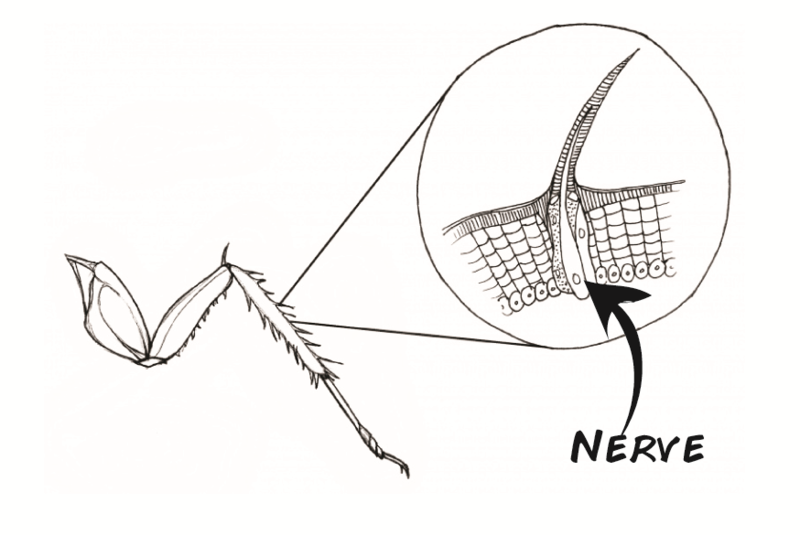 The major benefits of this approach are that the leg will grow back, and the cockroach nervous system provides wonderfully large APs that can be observed using the SpikerBox. Each segment of the cockroach contains a region of the Ventral Nerve Cord (VNC), a collection of neurons that send information to the muscles of the body, while receiving information from the sensory organs of the periphery. This information is relayed to and from the brain using action potentials and synapses. We look to measure these communications entering from the legs of the cockroach. When observed up close, you can see how the cockroach leg is covered with large spines along the tibia and femur. Each spine has a neuron wrapped around it, which sends APs to the VNC and eventually the brain. The pattern and frequency of APs sent will allow the VNC to distinguish a strong external stimulus from a weak one. Which hair cells are being stimulated will determine where the cockroach perceives the stimulation is located. With our smartphone you can interface the output of the SpikerBox to your iPhone using the free Backyard Brains app. Connect one end of your cable to the iPhone and the other to your iPhone, and open the Backyard Brains app. When your spikes are displaying, hit the record button. You can zoom in and out on your recording by pinching the screen. Your signal will be recorded as an uncompressed .aif audio file. You can then e-mail it yourself using our file system menus ("share" button) or over a wireless TCP/IP connection. You can also download to your DropBox! Note that you do not necessarily need to use the iPhone cable, you can simple place your SpikerBox next to your iPhone to record through the iPhone's microphone. It will be noisy though. The Backyard Brains iPhone/iPad application can be downloaded via iTunes via this following link. To use this app, you will need to purchase or make a SmartPhone Cable to link the SpikerBox to the iPhone. You can also record spikes on a laptop. We have released the Backyard Brains Spike Recorder app that works on any PC (MacOs, Windows, Linux, etc). To record your data, simply hit the record button. To play back your recording hit the play button. You can zoom in and out of your recording using crossed arrow button. Take a cockroach and either put it in ice water or a standard freezer to anesthetize it. Wait 5-10 minutes, or until the cockroach stops moving. Take care to monitor how long the cockroach has been placed in the water or freezer, as extended exposure to low temperatures can be fatal. 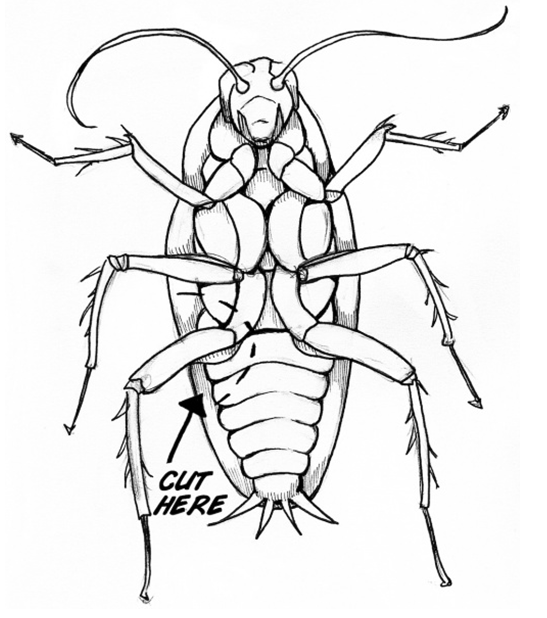 Once your cockroach has been anesthetized, remove it from the water or freezer and place it on your lab bench. Using dissection scissors cut off one of the mesothoracic legs (see below). Make sure you cut close to the thorax (body) so that the coxa remains attached. In the space provided below, sketch your cockroach and the leg you have removed. Note any damaged parts if applicable. Return your cockroach to its housing. The leg will grow back if the cockroach is not a full-grown adult yet. One way to distinguish the age of your cockroach is to note whether the wings are fully formed. Adults have wings while younger nymphs do not. Place the leg on the cork found on top of your SpikerBox. Make sure the coxa and femur of the leg are on the cork, while the tibia and tarsus hang freely (below) Insert the electrodes through the leg and into the cork. Insert one electrode into the coxa and the second electrode into the femur (below). The electrodes will measure action potentials as well as keep your leg in place. If you hear a popcorn sound, congratulations, you have just heard your first neuron firing! If you are not sure whether you are listening to spikes or noise, lightly touch spines located on the tibia with a toothpick. If you don't hear spikes in response to toothpick stimulations, try reinserting your electrodes, switching which one is in the coxa and femur. Once you are hearing spikes consistently, continue to the next section. You are doing extracellular recordings, that is, your electrode is placed outside the cell. How would the recordings differ if you were recording inside the cell? Would the amplitude of the spikes be the same or different? Would the positive and negatively charged portions of the recording look the same or different? (Hint: you may want to review the electrophysiology section to refresh yourself on the differences between the two types of recordings. Because the electrode is outside the cell, you are measuring changes in voltage just outside the cell membrane. Measurements taken from inside the cell membrane would be reversed (positive spikes recorded extracellularly would appear negative when recorded from inside the cell). Also, spikes recorded within a single cell all have the same amplitude, but an extracellular recording may be measuring the activity of several neurons at once, and therefore there may appear to be spikes of several different sizes. The electrode is measuring changes in voltage just outside the cell. 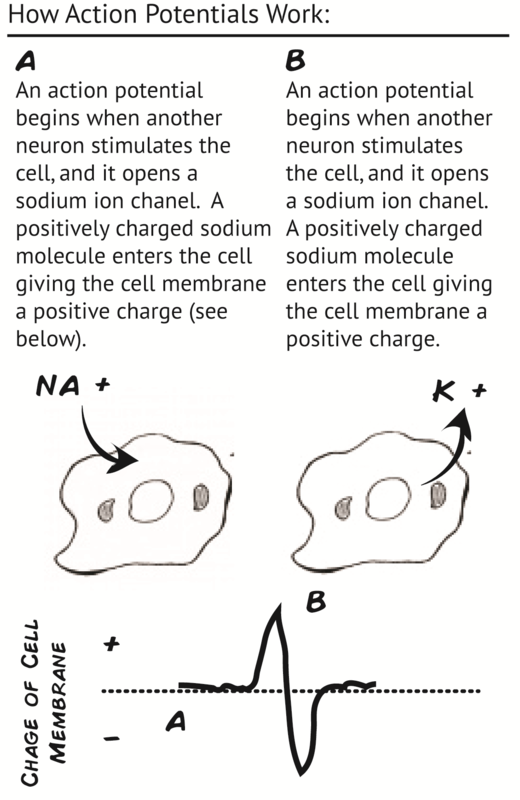 Therefore when an Na+ ion crosses a cell membrane into a cell, the electrode "sees" this as a negative charge, because the space near the electrode has lost the positively charged ion. When a K+ ion exits the cell, the electrode records this as a positive charge. Cockroaches are ectotherms (cold-blooded animals). They depend on heat from external sources for their physiological functions, such as movement. By putting the cockroach in ice, we removed it from an energy source (ambient air temperature) that allowed it to move. Based upon your initial results, are you primarily listening to spikes coming from motor neurons (neurons that tell muscles to contract) or to sensory neurons (neurons that send information from the periphery into the brain). Why? We are probably seeing the activity of sensory neurons because the leg is not connected to the central nervous system and so it is not receiving signals to move. However, it might be getting sensory information from movement in the air stimulating the hairs on it's leg. What changes would you see in your recordings if you were to blow on the cockroach? Would the changes caused by blowing be the result of activity in sensory neurons or motor neurons?